Now that cooler weather is kicking in, it’s time to break out some delicious soups! And my go to is always this tortellini chicken soup. I love a good soup on a cold rainy day. What is more comforting when it’s wet and gross outside? After 10 days straight of wet dreary weather, we needed some soup of warm us up. It’s time for our all time favorite soup: tortellini chicken! Everyone love chicken noodle soup as comfort food, and the substitution of tortellini gives the dish a pop of unexpected flavor. I prefer cheese tortellini, but have tried it with both sausage and mushroom fillings if that’s more your preference. This recipe is based on something my mom made growing up. It was from a cooking once a month cookbook. We tried that once and never did it again (so much work! ), but we did keep several recipes from that in our rotation, including the tortellini chicken soup! The best part about this recipe is that it’s so easy. I like to make it on a Saturday or Sunday when I can assemble it and then forget about it for the rest of the afternoon. Several hours later, I throw in the pasta, and then dinner’s ready! Pro tip: make a double batch, and freeze half right before you put in the tortellini. There’s dinner for next week! In these photos, I’ve made a double batch. Most of the ingredients. All that’s missing is chicken! 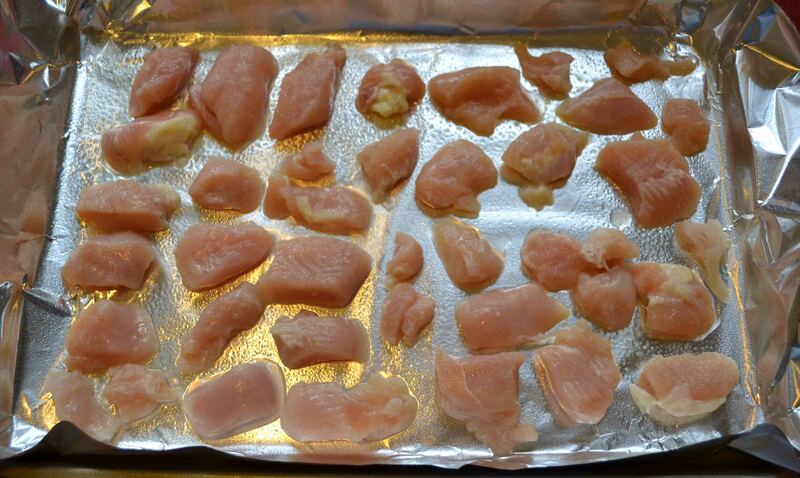 Start with your chicken – it needs to be cooked! You can buy a rotisserie chicken or bake it yourself. Today, I sliced it in small pieces (for faster cooking), then baked at 350°F for 15 minutes. Peel the onion and stick 3-4 whole cloves in. Seen here coated with parsley, which will go in the broth. 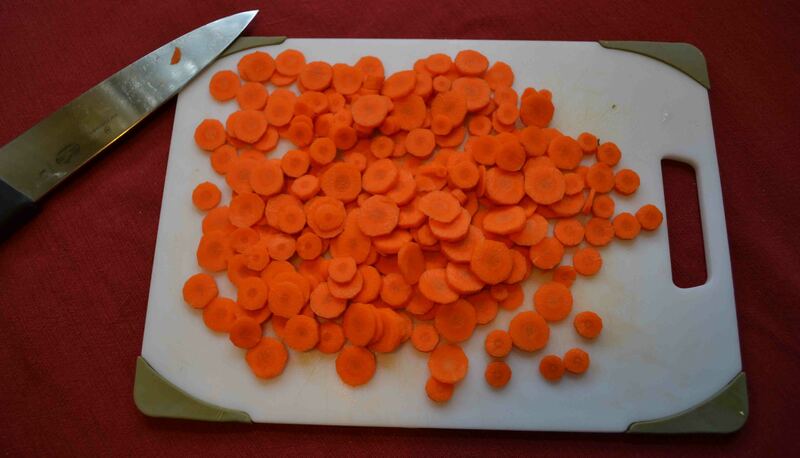 Peel & slice the carrots! 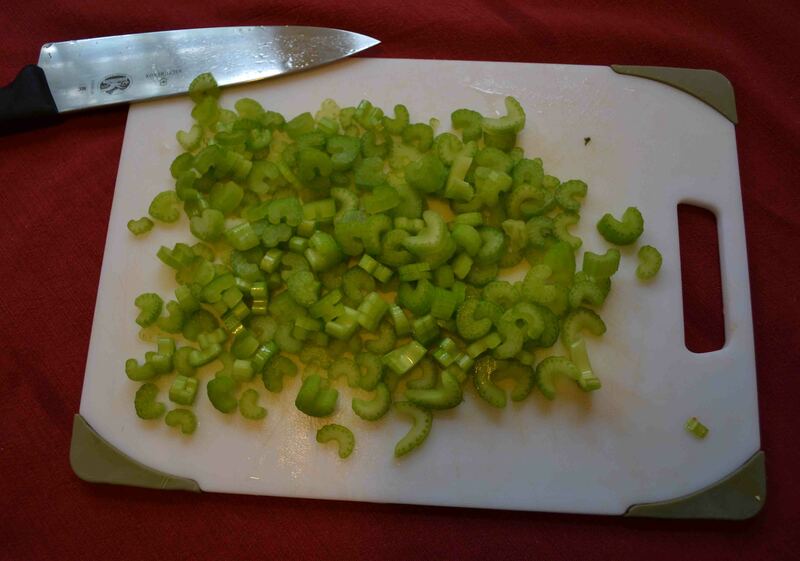 Now slice that celery. For those who don’t like celery, you can’t really taste it. But feel free to substitute other veggies too! Finally, combine your ingredients into the biggest pot you can find! Chicken broth, parsley, onion, carrots, celery, salt, and shredded chicken. Cook on low for 3-4 hours uncovered. When you’re ready to eat, heat back up to bubbling and add in the tortellini. Cook for 20-25 minutes and enjoy! Look at that goodness! You can choose to add more or less chicken broth, depending on how much liquid you want your soup to be. I tend to store it with less liquid but keep some on hand to add to my leftovers as I want it! If not done already, cook & shred chicken. Peel and cut off ends of onion. Insert whole cloves into one end. 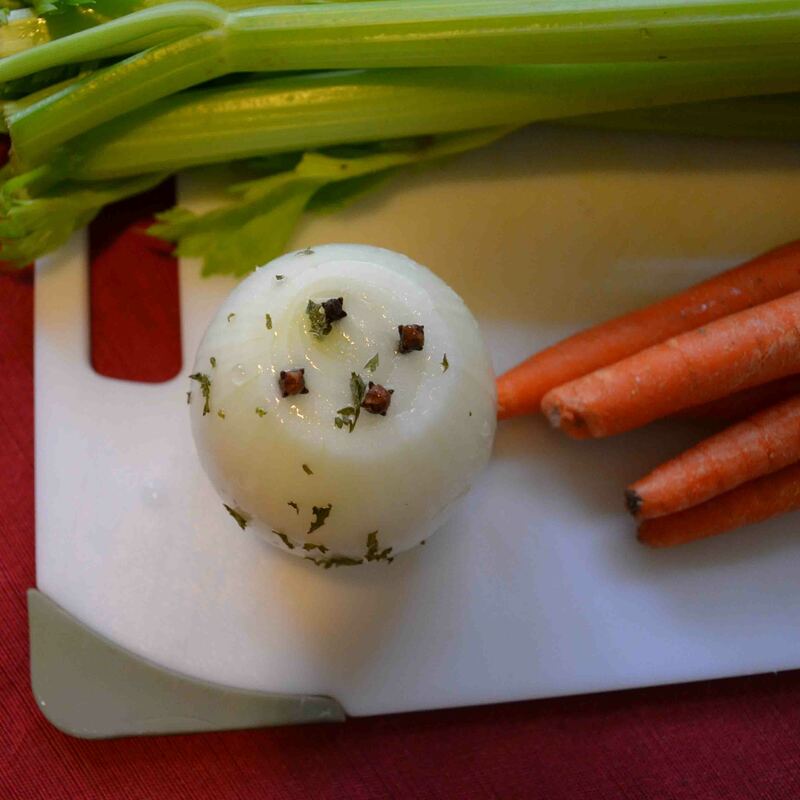 In a large pot, combine chicken broth, onion, parsley, salt, carrots and celery. Bring to a boil, then reduce heat . Simmer low uncovered for at least 1 1/2 hours. If you’re freezing part or all, do it here. Add tortellini to the mixture and boil for 20-25 minutes more, until tortellini is cooked. Hello, Emma! Ben showed me your blog when we were at Grandma’s. My comment is that if you are simmering the soup for 3-4 hours, there is no need to precook the chicken; in fact, if white meat especially, cooking that long may even make it tough. I just saved you a step, you’re welcome!! Sweet, that makes it even easier! Thanks Suzy!